DSQUARED2 glasses prove that keeping up with trends can be fun. 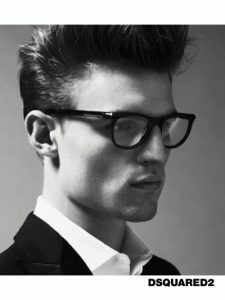 This label stands at the front of the line when it comes to churning out beautiful, fashionable frames that turn heads. 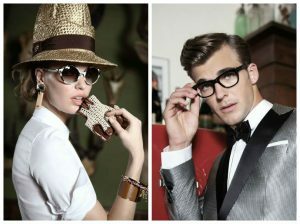 It’s no coincidence that people who love imagination, romance, drama and edginess also tend to love DSQUARED2 glasses. This label’s eyewear line certainly has a flair for the dramatic when it comes to colors, textures and cuts. It is easy to picture many of the label’s top eyewear designs being featured in films and music videos. You might even say that each pair of DSQUARED2 glasses is like art for your eyes. DSQUARED2 is a fashion label that really keeps things in the family. This rising Canadian fashion brand was founded by twin brothers named Dean and Dan Caten. The brothers embraced fashion as young students in New York City in the 1980s. Of course, the raw talent and exposure to European influences that the brothers were gifted with soon helped to launch them toward their shared destiny of becoming famous fashion designers. They had already formed their fashion label together by 1986. The brothers have used their talents to dress some of the biggest names in the entertainment business since then. Their list of famous devoted fans includes Britney Spears, Madonna, Ricky Martin, Justin Timberlake, Kendrick Lamar and Lenny Kravitz. The brothers were also chosen to design uniforms for the Juventus football team. They recently decided to make the DSQUARED2 label more accessible to the general population by opening boutiques in Milan, Paris, Hong Kong, Singapore, Athens, St. Moritz, Mykonos and Capri. In addition, the DSQUARED2 label also unveiled a line of cheap prescription glasses that provide quality craftsmanship and beauty for everyday people. DSQUARED2 is on the rise when it comes to being recognized as one of the hottest eyewear lines of the moment. The label satisfies the desire to enjoy the perks of both cheap prescription glasses and upscale designer glasses. Designs by DSQUARED2 feature the quality details and components that are so popular among high-end brands. In addition, they offer cutting-edge touches that are commonly found in the trendiest looks of the moment. This is a label that isn’t afraid to offer experimental looks that defy expectations and abandon conventions. Of course, it’s also easy to find very conservative looks if you prefer designer glasses that go perfectly with business attire and everyday outfits. The DSQUARED2 brand is a perfect option if you like the idea of finding a pair of classic frames with just a hint of sparkling madness. Is DSQUARED2 really just a brand that big stars wear on the screen and stage? The reality is that DSQUARED2’s gorgeous designs are meant for people who crave the fun of being able to unleash their inner superstars. DSQUARED2 eyewear is made for anyone who likes to show off their spirit using imaginative, bold eyewear looks. There is no denying that DSQUARED2 designs are beloved by the younger generation. It is hard to resist the desire to want to wear the same looks and styles that you see on your favorite singers and stars. DSQUARED2 frames are perfect for anyone who wants to grab hold of the biggest trends of the moment. What is really exciting about this label is that it also offers understated and timeless designs that allow older customers to dip their toes in the wacky waters of today’s cutting-edge fashion scene. Many customers are quite surprised that a label that is so famous for offering edgy, flashy looks can actually churn out stunning eyewear designs that are effortlessly classy and timeless. There are many everyday looks buried within the collection that are ideal for the classroom, the workplace or everyday situations. DSQUARED2 is a label that was created for Hollywood. The brand rose to fame because it was embraced by big stars very early in its existence. DSQUARED2 frames have been spotted on big celebrities like Jennifer Lopez, Alicia Keys, Hillary Duff, Ashley Greene, Fergie and Cameron Diaz. These stars know that there is no better brand to choose when it comes to embracing their creative sides. In addition, they know they can trust the quality craftsmanship that goes into every pair of DSQUARED2 frames that is created. People who love DSQUARED2 glasses know to expect beautiful touches on every pair they purchase. The label excels at putting new spins on classic looks. For instance, you’ll find classic cat-eye frames that have little gem-encrusted accents at the temples. In fact, gemstone embellishments are used in many styles in the DSQUARED2 line. This is a label that isn’t afraid to play with shiny objects and shimmering touches. There are even many aviator designs that have been upgraded to feature futurist touches and edgy lens shapes. Some of the truly edgy designs offered by DSQUARED2 feature sharp points that jut out from the temples of frames. You’ll even find frames that feature draping gold chains near the temples. It’s easy to look like you’re living your life inside a music video when you embrace some of the edgier DSQUARED2 styles available today. Of course, classic square designs and rimless frames are also represented abundantly in the current collection of DSQUARED2 glasses. Share with us and our thousands of readers in the comment sections below of your favorite DSquared2 glasses and tell us the story of how you found them and what inspired you! This entry was posted in DSQUARED2 glasses and tagged cool glasses, designer glasses, DSQUARED2 glasses, Glasses. Bookmark the permalink.